Today, This Do It Yourself Lady has two polishes by Pomegranate Nail Lacquer to show you guys. The polishes are called Cardigan and Curator. Both from their Fall 2012 Collection. First up, I'll start with Cardigan. In case you were wondering why it looks like rubber, I'll say right now that it's a jelly polish. The Good opaque kind of Jelly! It's squishy and it's surprising not as SHEER as I thought it would be. What you see here is 2 thick coats (Allow first coat to dry before 2nd coat). I was tempted to add a third coat but I chose not to since I loved how it looked at 2 coat. It definitely reminds me of a comfortable cardigan. Black Polishes like this make me say "Oh Yes, I Love black". I believe if you're gonna wear black, might as well make it a very noticeable black. I'm wearing this as my weekend mani. I love how embedded the gold and silver glitters are in the black. What you see here is three coats. All swatches are with Topcoat. I'll say this up front, this brand is relatively new to me, but I love trying polishes by brands I hadn't previously known about. I've heard some people state this as well, so I know I'm not alone. The Polishes have regular polish smell and they're not offensive. Each polish came in a 16.5ml bottle. When I tried out Cardigan, I immediately had a "OMG, why so sheer" look on my face. Then I looked closely and found out it was a jelly, and that looked turned into a "OMG, a blue/teal JELLY, MAMA LIKE"!!!! LOL... Honestly, It was as if some lights started shinning in my room, I immediately was happy. I waited for the first coat to dry and applied the second coat effortlessly! Topped it off with a topcoat, and I loved the finished look. So squishy and yummy looking!! Curator is what I want my black polishes to look like.. NOT plain. I love the glitters in it, and application was very easy. It got opaque in two coats but I Love glitter, so I applied three coats. I like that this brand not only makes pretty polishes but also have great formulas. 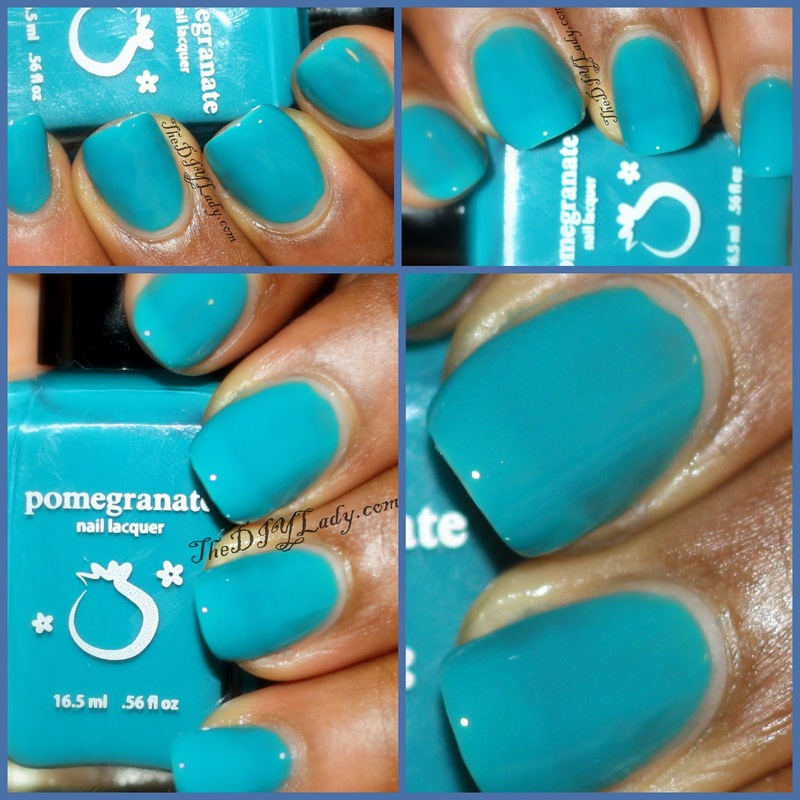 If you like what you see and want to check out other polishes by Pomegranate Nail Lacqquer, Check out their Website. Also keep up with them on Facebook and Twitter. Sweet. I hadn't heard of them either. But now, I know I want more colors by them. I love the teal color!! Curator looks really good on you. i really love the blue! its soo intense! love it! !